Stock # 919936, Duramax 6600 Turbo Diesel V8 Engine, Automatic, 127997 mi. Thank you for visiting another one of Auto Source of Texas's online listings! Please continue for more information on this 2005 GMC Sierra 3500 DRW SLE with 127,997mi. This GMC includes: TRANSFER CASE, ELECTRONIC SHIFT TRAILERING WIRING PROVISIONS, FOR CAMPER, 5TH WHEEL AND GOOSENECK TRAILER MIRRORS, OUTSIDE REARVIEW, POWER, HEATED, CAMPER-STYLE Integrated Turn Signal Mirrors Power Mirror(s) Heated Mirrors SEAT TRIM, LEATHER Leather Seats AIR CONDITIONING, DUAL-ZONE, AUTOMATIC, INDIVIDUAL CLIMATE SETTINGS FOR DRIVER AND RIGHT FRONT PASSENGER Multi-Zone A/C A/C Climate Control SOUND SYSTEM FEATURE, STEERING WHEEL MOUNTED RADIO CONTROLS, RADIO AND DRIVER INFORMATION CENTER (DIC) Steering Wheel Audio Controls SEAT ADJUSTER, POWER, DRIVER 6-WAY Power Driver Seat SOUND SYSTEM, ETR AM/FM STEREO WITH 6-DISC CD CHANGER CD Player AM/FM Stereo CD Changer Premium Sound System TRANSMISSION, ALLISON 1000 5-SPEED AUTOMATIC, ELECTRONICALLY CONTROLLED WITH OVERDRIVE AND ELECTRONIC GRADE BRAKING 5-Speed A/T Transmission Overdrive Switch A/T SEATS, FRONT RECLINING BUCKETS, INBOARD ARMRESTS, DUAL ADJUSTABLE HEAD RESTRAINTS Power Driver Seat Bucket Seats HEAVY-DUTY POWER PACKAGE Diesel Fuel Locking/Limited Slip Differential 5-Speed A/T A/T 8 Cylinder Engine Turbocharged *Note - For third party subscriptions or services, please contact the dealer for more information. * This 2005 GMC Sierra 3500 comes with a CARFAX Buyback Guarantee, which means you can buy with certainty. Why does this vehicle look so great? The CARFAX report shows it's only been owned by one owner. Do you encounter heavy snow, rain or mud when driving? No problem. With this vehicle, you've got the power of 4WD to help you overcome the toughest terrain. In addition to being well-cared for, this GMC Sierra 3500 has very low mileage making it a rare find. 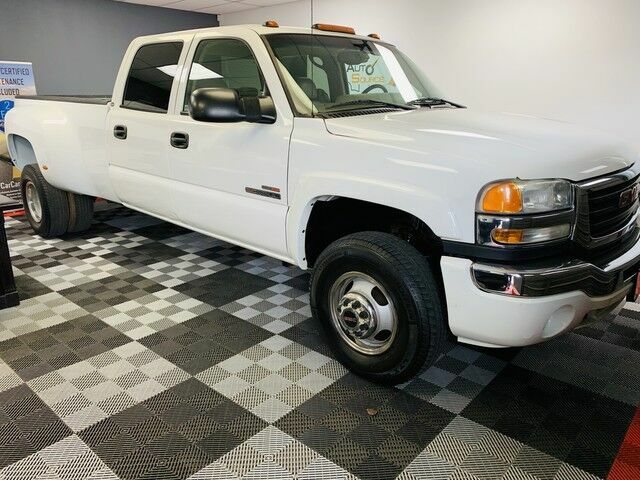 Marked by excellent quality and features with unmistakable refined leather interior that added value and class to the GMC Sierra 3500 When this vehicle was shipped from the factory, GMC decided that no option should be left off of this magnificent automobile. So, if you're in the market for a GMC Sierra 3500 DRW SLE that is equipped with copious amounts of options, then we may just have the perfect vehicle to suit your needs.